With its picturesque houses, pubs and restaurants clinging to the sides of the hills rising above the blue waters of Cardigan Bay, it is easy to believe that New Quay is the “cliff-perched town at the far end of Wales” immortalised by Dylan Thomas in “Under Milk Wood”. Indeed he lived here in 1944 in a little house called “Majoda” atop the cliffs opposite the town. It is believed that the famous poet also wrote "Quite Early one Morning" during his stay. The Dylan Thomas Trail in New Quay takes the visitor to many of the places either frequented by Thomas or believed to be mentioned in the play. The film "Edge of Love" about Dylan and Caitlin starring Matthew Rhys, Keira Knightley and Sienna Miller was filmed here recently. You can often be lucky enough to see the famous Cardigan Bay Dolphins from the pier, or book with New Quay Boat Trips for an alternative chance to see them as well as grey seals and many seabirds. Guillemot and Razorbill nest on the cliffs of the area, and you may spot the rare Chough and increasingly common Red Kite. You can find many colourful wild flowers along the coastal path and a great diversity of marine life in the rock pools along the coast. There are beautiful walks from New Quay, with one of the most popular being the Ceredigion Coastal Path - leading to Aberaeron in the north or to Llangrannog and Aberporth in the south. There is a wide range of adventure activities available locally: horse riding, mountain biking, coasteering, climbing, white water rafting, sea and river kayaking, fishing, paragliding, karting, surfing, sailing, windsurfing and much more. 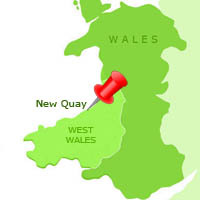 Historically New Quay was a fishing and smuggling port. Later a thriving shipbuilding industry developed, reaching its peak in the middle of the nineteenth century. Towards the end of that century shipbuilding died out, railways came to West Wales and tourism became the main industry. New Quay's Pier was built in 1835 by Daniel Beynon, and once sported a pepperpot lighthouse- sadly lost in a storm in 1938. With lots of shops ranging from musical instruments at RJ Guitars, to gifts, modern art and handbags, there is plenty of browsing to be done. Eat lovely fish and chips at The Captain’s Rendezvous and a scrumptious variety of ice cream at Creme Pen Cei. Also worth a visit is Cardigan Bay Marine Wildlife Centre which is informative, educational and dedicated to raising awareness of the marine environment in and around New Quay. Evening entertainment is varied, with a number of pubs to choose from. Enjoy a lovely meal in the Wellington Inn, a drink in the Dolau Inn or if you like live music, spend an entertaining evening in the football club. The beaches of New Quay are also beautiful: Harbour Beach, Traeth Gwyn and Dolau. The first of these is the main safe beach for swimming and is patrolled by lifeguards during the summer months. Traeth Gwyn is a long stretch of golden sand between New Quay and Cei Bach. Dolau is a smaller sheltered beach east of the pier. On days with no wind, the sea is as calm as a millpond and seagulls float languidly around in the bay. Looking for somewhere to stay in New Quay? See holiday cottages in New Quay.